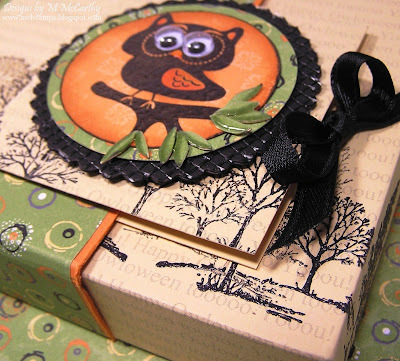 Sharing a new box with you for OWLoween.... priceless! 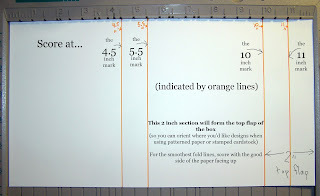 1) Stamp or emboss him in black on a circle of designer paper (orange paper from SU's Bali Breeze DSP) Sponge the orange with ink for dimension. Add orange marker to wings. Put Crystal Lacquer on his beak. Add googlie eyes. 3) Make a black textured mat by sticking black Magic Mesh onto black cardstock & die-cutting it with Nestabilities scallop circles. 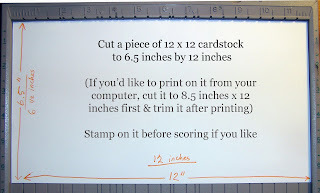 Stick the black scallop on with black foam tape & add it to a note card. Step 2) Score it 4 times at the 4.5, 5.5, 10 & 11 inch marks. 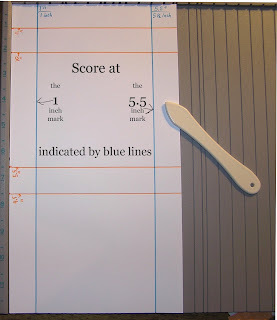 Step 3) Turn it and Score 2 times at the 4.5 & 5.5 inch marks. Step 4) Make the cuts: Cut away the two pairs of small square at the top 2 inch portion (to the right & left of where it says Top Closure flap) And cut 4 slits in the sides at the middle (cut along the score marks indicated by the orange lines & stop cutting at the score marks indicated by the blue lines) to make flaps. Step 2) Score at the 4.5, the 5.5, the 10, & the 11 inch mark. This gives you the bare bones of the scoring. 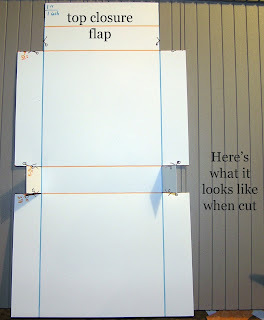 (In hindsight, I would add the adhesive on the back of the small flap.) You can stick the band together a little while it's on the box & then slide it off and press firmly to get a good stick. Hope you had even half as much fun checkin' this out as I did makin' it to share with you. Happy OWLoween! & Stampire hugs to You! 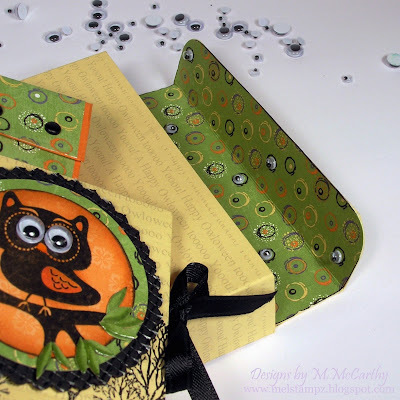 Cuteness...love the paper and color choices here! Super job! Awesome! I love all the details to your directions - you rock! Happy Halloween~! This project is Preciless! Love this little owl! And idea with the eyeballs inside the box is ROCK! Thank you so much for this great project! 1. You have black nailpolish for halloween! 2. The leaves on the tree branch oh so clever..
3. The trees that are stamped across the layers. MEL!!! I wish I could think outside the box like you do. This is super! I crown you the Paper and Ink Diva! Thanks for sharing so generously ALL the time with us. This is SPOOKTACULAR! I love it! The owl is amazing! I love the papers you used too! WOWZERS you so ROCK! I know it takes you are really long time to put this up for us and we all really love it! This is and outstanding box! Happy Halloween! 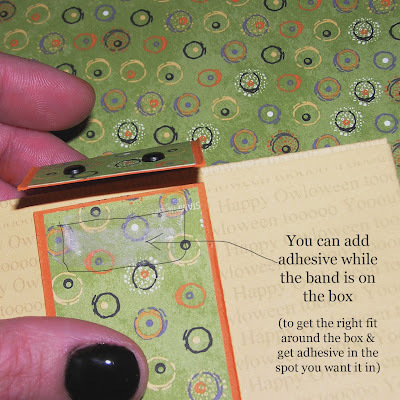 Thanks for a wonderful project Mel - going to try this simple box technique - it looks owlsome!!! This is so stinkin' cute I can't stand it! I really love what you did w the leaves, too! Darn it, my printer's almost out of ink! I love, love, love this! It is the cutest!! Oh Mel, you've done it again! OWLcute is that!!!! Oh my gosh! 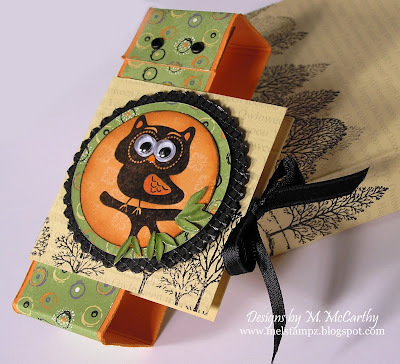 Thank you for showing us step by step how to make this totally cute box .... I'm thinking I am going to have to try it out. I love your quick and easy box! 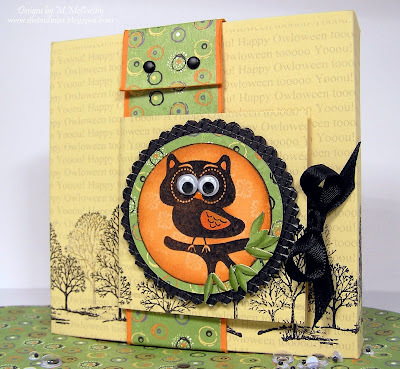 Cute cute owl and great look with the scalloped circle with the black mesh. Great black nails for halloween too! You rock! Thanks for sharing how to make this box. It's darling. Love the wiggling eyes!! Too cute! This is just an awesome project! You did such a great job! How cute that owl is and how sensible the box is! Thanks for the tutorial too! You can't say it is the easiest, when you post 42 (exaggerating) pictures in the tutorial. You need to start doing some video tutorials gf. Really cute! Mel that owl is so darn cute with the googly eyes!! Love the box. . .I have to try it out! Love making different types of boxes!! You chose a nice color combo. . .very pretty! Thanks for the tutorial. . .maybe I'll try it out this weekend!! oooooooooooh so its called a BELLY BAND and not a BELT LOL! Thanks for the info! I give weird names to techniques, seriously not funny! The box rocks tho, i wish i had a scor pal! but i will be getting my cuttlebug folders soon!!!!! I love how you added the card to the belly band!! And that owl and leaves are fabulous! !